This collection presents the development of the postal service organization in Finland through the autonomous Russian Grand Duchy, the russifying era, the World War I, the inde­pen­dence war until the first years of independence. The presentation is based on the Postal Regu­lation and the Management Order of 1881 which came into practice on the 1st of July, 1881. 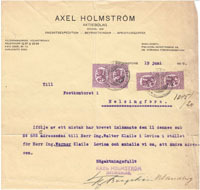 Addi­tional orders are published in the Imperial Rules and Declarations and also in the circular letters and in the general letters of the Postal Service. This presentation covers the validity time of the Postal Regulation of 1881: 1st of July 1881 - 1st of July 1924, when the next Postal Regulation was published. The postal arrangements are presented using the postal documents, focusing in the markings on them. The markings have been made either for the sender or for the addressee and they may have been written either on the postal matter itself or on the related documents, such as receipts. The specification of rareness is based on the registers of detected postal items. 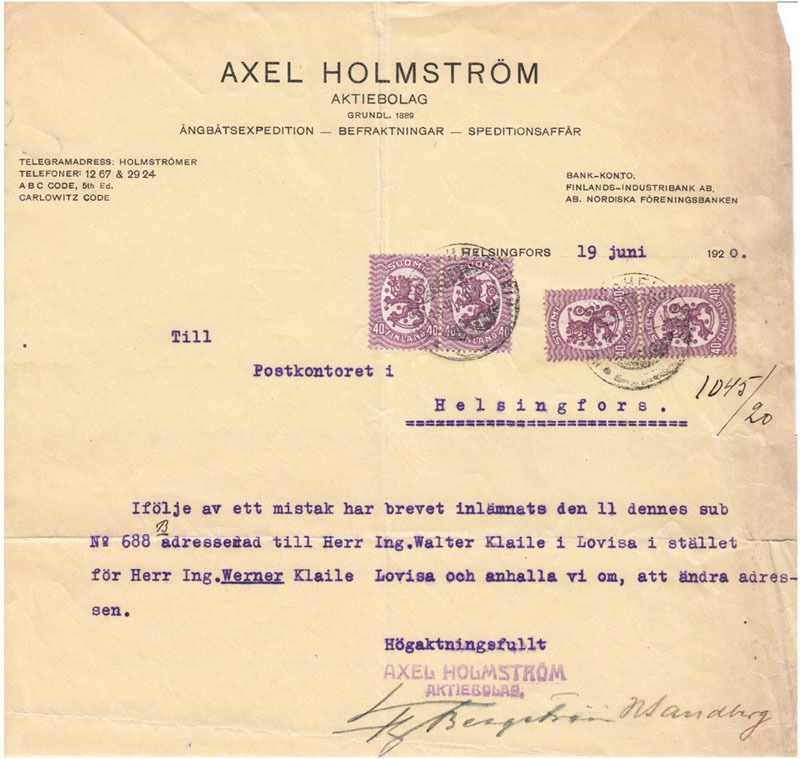 For example the register created by Mr. Ari Muhonen is used in the case of the model Saarinen stamps (M1917). In this register there are around 5200 postal items from 66 different exhibition collections. There has been substantial personal archive studies to create this collection. The results of the studies has been published by the maker of the collection in his books “Domestic Postal Organization in Finland”, 2004; ”Finnish foreign letterpost 1875-1943”, 2010; and ”The parcel post from Finland to abroad 1888-1942, rates and main regulations”, 2013; published by Joutjärven Postimerkkikerho ry and printed in Espoo, Finland. Information about different post offices is found in the book “Suomen postitoimipaikat 1638-1985” (“Post offices of Finland 1638-1985”), published by the Philatelic Federation of Finland and printed in Vammala, Finland, 1988.